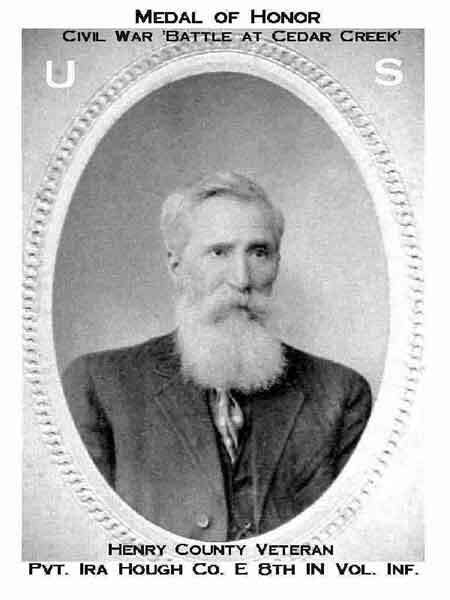 Ira Hough was born in Henry county on 2 Jul 1843, the son of Jesse and Dorothy Jenkins Hough in Liberty township on the farm of his fraternal Grandparents, Ira and Elizabeth Hough who came to Henry county from Stokes, North Carolina. They were Quakers and members of the Deep River monthly meeting, transferring their membership to the New Garden monthly meeting and were received into the Flat Rock Friend's Church on 17 Apr 1830. Ira and Elizabeth had seven children, Alfred born 8-16-1810, Josiah born 11-5-1812, Jesse born 7-11-1816 (Father of Ira), Asenath born 8-19-1819, Mahlon born 12-11-1823 and Nathan born 7-5-1829. Ira Hough purchased land in Liberty Township in section # 8, about one mile northeast of Ashland, IN on 3 Sep 1829. Jesse and Dorothy Jenkins Hough were married about 1840 purchasing 80 acres of land in Blue River Township on 28 Jul 1840, then selling that land on 25 Sep 1841 moving back to Liberty Township. They had Three children, one who died in 1841 at twelve months and one day old, Ira who was born on 2 Jul 1843 and Irilla who was born on 29 Jun 1845. Jesse Hough died sometime in 1852 and is probably buried in the Flat Rock Friend's cemetery along with his first child and his ancestors, the only marker in the cemetery is for his infant child that died in 1841. After the death of Jesse, Dorothy and her children Ira and Irilla moved to Harrison Township just north of Cadiz, Indiana. Sometime around 1855, Dorothy married Shubal Denney, a native of Virginia who had three children of his own. In 1860 they were still living near Cadiz with a family consisting of Shubal and Dorothy Hough Denney, Jacob Denney, Delila Denney, Dorothy's stepchildren and Levi Denney, their son, Mary their daughter and Dorothy's children Ira and Irilla Hough. On 20 May 1863, at age twenty Ira enlisted in the Union Army at Middletown, Indiana and was assigned as a private to Company E, 8th. Rgt. Indiana Infantry. He was described as 5' 11 1/2", fair complexion, black eyes, black hair and was a farmer who was born in Henry county. Ira served in the Union Army from May 1864 until his Honorable Discharge 28 Aug 1865. Ira participated in the following major battles during his service-Battle of Winchester, VA 19 Sep 1864, Fisher's Hill, VA 22 Sep 1864 and Battle at Cedar Creek, VA. 19 October 1864. 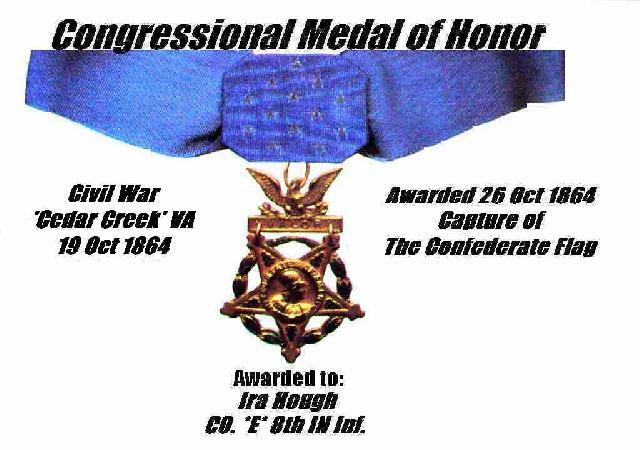 It was in the battle at Cedar Creek, Virginia that Ira was nominated for the Congressional Medal of Honor for the capture of the enemy flag. After the battle of Cedar Creek he was given twenty days leave by orders of General Sheridan and sent to Washington to meet President Abraham Lincoln to receive the Medal of Honor. 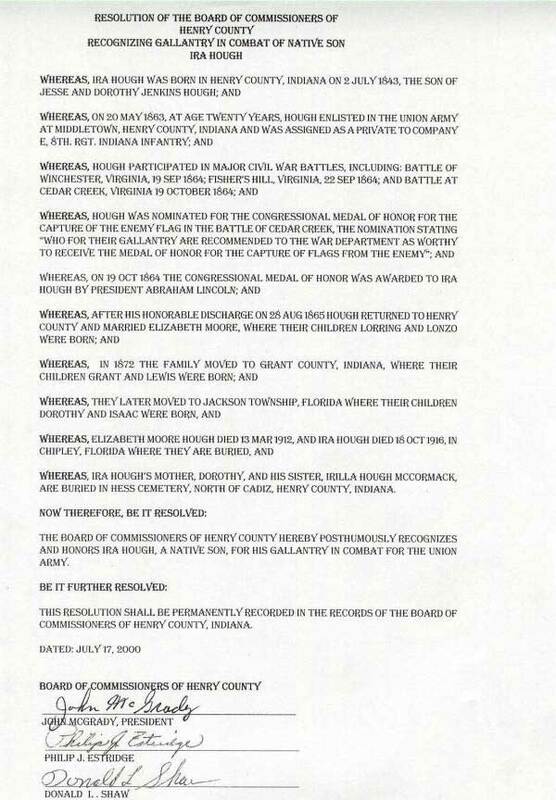 His nomination states "Who for their gallantry are recommended to the War Department as worthy to receive the Medals of Honor for the capture of the flags from the enemy" Ira was awarded the Medal of Honor on 26 Oct 1864 by the President of the United States, Abraham Lincoln. After the war was finally over, Ira returned to Henry County and on 16 Jan 1868 Ira married Elizabeth Moore of Middletown, In. His sister Irilla had married John W. McCormack on 16 Apr 1866. Ira tried farming for a while just southeast of Middletown. Ira and Elizabeth had the following children by 1871, Lorring, Alonzo and Jesse Hough who were born in Henry County. In 1872 Ira moved to Grant County, IN, Where two more children Lewis and Jacob Hough were born. In 1888 Ira moved to a farm just north of Chipley, Washington County, Florida. Ira and Elizabeth had two more children, Dorothy and Isaac. In March of 1902 Elizabeth passed away. Ira moved to Missouri staying there until 1907 when he moved back to Jackson County, Florida. Elizabeth died on 13 Mar 1902 in Chipley, Florida. Ira died at the residence of L. J. Collins Jr. on 18 Oct 1916 at Chipley, Florida. They are buried side by side in the Salem Methodist cemetery in Chipley, Washington County, Florida. Ira's mother Dorothy died on 14 Nov 1888 and is buried in the Cadiz Friend's cemetery, Cadiz, Indiana. Ira's sister Irilla Hough McCormack died on 9 Aug 1894 and is buried in the Hess cemetery north of Cadiz. His Grandfather, Ira Hough died on 4 Mar 1832 and is buried in the Flat Rock Friend's cemetery in Liberty township.